A Natural Resources Canada-backed research project is looking to devise remote predictive mapping (RPM) methods aiding exploration in the north of the country. The Vancouver Island University (VIU) research project will, the university says, “provide a unique opportunity to examine the glacial landscape of Canada’s North”, resulting in new mapping methods to help identify sources of sand, gravel or minerals. “Canada’s North is rich in natural resources and a major driver of economic growth in the region,” VIU said, adding that large mineral deposits could include diamonds, gold, silver, copper and other base metals. VIU Professors Dr Jerome Lesemann (Earth Science Department) and Dr Brad Maguire (Geography Department), with the help of Yiqing Luo, a VIU Master of Geographic Information Systems Applications student, are being funded by NRC’s Earth Sciences Sector to assist with developing these RPM methods. Mapping of surficial materials is an integral component of development in northern Canada, but traditional methods involve time-consuming and expensive aerial photographs and field verification, according to Maguire. 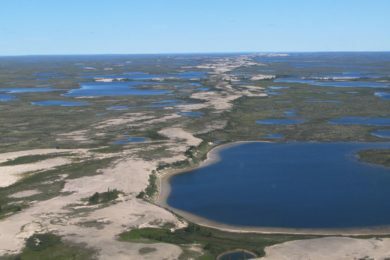 Lesemann and Maguire’s research project aims to develop a methodology for computerised detection of the sediment components of eskers, ridges of gravel and sand that occur in formerly glaciated regions of northern Canada. Using newly available digital terrain models, landforms like eskers can be identified and mapped in great detail, according to VIU. The team is developing a methodology to automatically detect and map these landforms, and proposes to develop an esker element detection methodology based on deep machine learning (a form of artificial intelligence) supported by a convoluted neural network (CNN). CNN uses computer algorithms to try and replicate complex cognitive processes of the human brain. The aim is to train a computer to recognise patterns, similar to the way a person, through experience, knows that when it looks at a dog, it know it’s a dog and not a cat even though they share some similarities but also key differences. “The form and structure of eskers are complex and if we can teach a computer to learn what an esker looks like, we may then be able to identify other eskers automatically,” Maguire said. The project is funded by a C$35,000 ($26,376) research grant provided by the NRCAN Geo-Mapping for Energy and Minerals programme, a 12-year initiative to significantly advance and modernise geological knowledge in the North to support increased exploration of natural resources and inform decisions on land use and responsible resource development.